Now, as I was explaining in a previous post, this particular narrative is a "sandwiching" story. And in academic circles, it is referred to as narrative intercalation,1 which is a fancy way of describing one story that's inserted between one other story, effectively splitting one story into two by means of a second story. And the purpose of the first story -- the one that gets split into two parts -- is to provide a context and commentary upon the second, central story "sandwiched" in between. In Matthew 9:18-26, the first story is about a "ruler" whose daughter has just died and Jesus' willingness to go and heal her; whereas the second story is about another daughter, a daughter of an even greater "ruler" in Israel, a "daughter" of God himself. To appreciate this distinction, let's first take a look at Matthew's perspective regarding this "ruler" and his entrance into the narrative. "While he was saying these things to them, behold! one of the rulers came in and knelt before him, saying, "My daughter has died just now! Nevertheless, come place your hand upon her, and she will live." Now, if you were one of the original recipients of Matthew's gospel, namely a 1st century Palestinian Jew, then this interruption of table-fellowship would have been very alarming, and for many reasons too. The first shock would have been in hearing about "one of the rulers" coming directly to Jesus. In context, because this "ruler" is not distinguished by any title of gentile nobility or official rank, most commentators suggest that it would have been understood by Matthew's audience as a Jewish ruler of a local synagogue. Hence, Mark and Luke go out of their way to clarify to their audience (which was different than Matthew) that this ruler was a "ruler of the synagogue" (Mk. 5:22; Lk. 8:41). As one of the rulers of a synagogue, this man would have been a leader and director of weekly worship, and he would have been known by all of the local Pharisees in town, including those present within Matthew's house. And yet, despite the conflict which would undoubtedly ensue in future relationships among the Pharisees, this "ruler" of a synagogue bursts into Matthew's house, falls to his knees before Jesus in a posture of worship and abject humility, just to tell Jesus that his daughter has just died.4 Now, it doesn't take a rocket-surgeon or a brain-wizard to figure out that Matthew is painting a word-picture of complete and utter desperation. This ruler has no one else in the world that he can go to for help. And his tremendous faith in God is manifest, not only in believing that Jesus could bring his daughter back to life, but that he was willing to confess this in front of everyone -- even his respected colleagues. But this is still only part of Matthew's shocking introduction to this narrative. Not only is this ruler a respected leader among the Jews, and not only his he disrupting table-fellowship in Matthew's house, and not only is he kneeling before Jesus in a posture of worship before the Pharisees, and not only is he displaying a very clear belief that Jesus -- and Jesus alone -- can raise his dead daughter back to life, but this ruler insists that Jesus only has to touch his daughter to be healed. It is at this point which Matthew's audience would have definitely been aghast. Every Jew understood that a plea from a Jewish "ruler" to intentionally touch a dead body was more than just a faux pas or slip of the tongue. That was a huge doctrinal statement. In essence, this Jewish ruler was willing to let everyone know that Jesus could cleanse the absolutely unclean. Within first century Jewish tradition, contact with dead bodies was absolutely prohibited by priests and Levites, and as E.P. Sanders has argued persuasively, most "rulers" of the synagogues (archisynogogos) were priests.5 Not only was direct contact with the dead prohibited, but they were forbidden to enter any house, or approach any spot, where a dead body was lying or had been buried, or even any part of a dead body -- even a piece the size of a grape -- or blood to the amount of half a "log" (which was a little over one cup in modern measuring standards). The ruler was also forbidden to touch anyone or anything that became unclean through contact with parts of a dead body.6 And so, what we find in this brief narrative is a ruler who knows the Rabbinical traditions of law, and yet he still publicly confesses his faith that Jesus can raise his dead daughter to life again by touching her. From this perspective, this ruler is not merely desperate; he really believes that Jesus is the only "ruler" in Israel with the authority to touch his dead daughter. This ruler is incredibly faithful -- more faithful, in fact, than the Pharisees who are squabbling over eating with tax collectors and "sinners." If anyone is going to be viewed as a "sinner" in the eyes of the Pharisees from now one, it's this Jewish ruler and the man he kneels before publicly. But there is still a lot more going on in this brief narrative. Not only does this ruler risk his public reputation in order to confess his faith in Jesus, but Jesus actually gets up and follows him! This is the first time in all of Matthew's gospel where Jesus is said to be "following" someone. All we have seen up to this point are people drawing near to Jesus. But now, even in the midst of table-fellowship and feasting, Jesus stops what he's doing, gets out of his seat, and follows this ruler to his house. What an amazing event to behold! Matthew also mentions that the "disciples" of Jesus followed along too. People must have flocked toward Jesus once they saw him get up and follow this ruler, which means that Matthew's house must have become really crowded shortly after they saw Jesus get up and leave suddenly. 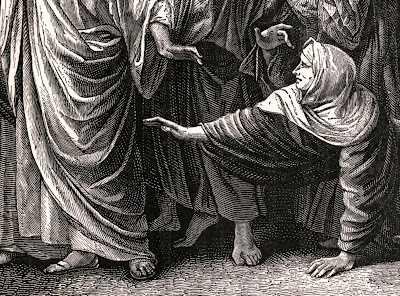 Interestingly, Mark and Luke both go out of their way to emphasize that there were crowds of disciples swarming around Jesus and pressing him in on all sides (Mk. 5:24; Lk. 8:42). "And behold! a woman who had suffered from a discharge of blood for twelve years came near behind him and caught hold of the tassel of his garment..."
1. I explain more about intercalation in the link. 2. A triad is a group or set of three things, and here in Matthew chapters 8 & 9 there are three sets of triads separated by two narrative interludes. For more information about the literary structure of Matthew 8 & 9, see my previous post here. 4. Mark and Luke both begin their narratives with the ruler's daughter as "dying" (Lk. 8:42, 49) and "at the point of death" (Mk. 5:23, 35), whereas Matthew clearly wants his readers to recognize how dramatic this scene was in real life, by depicting the daughter as having been dead already. In both accounts of Mark and Luke, Jesus receives a report that the daughter had just died, and yet Jesus travels to the ruler's house anyway. In contrast with that, Matthew is obviously not interested in "sandwiching" his story with details about a dying girl. Mark and Luke both "sandwich" their stories by beginning with a daughter who is alive (but dying), and then they both finish with the same daughter dying (in order to resuscitate her). But Matthew is only interested in beginning with a dead daughter and ending with a risen daughter. 5. E. P. Sanders, in his book Judaism: Practice & Belief 63 BCE-66 CE [London: SCM Press; 1992], makes the claim that priests controlled most of the synagogues, even those among the Diaspora. He writes: "Philo indicates that priests retained their status as leaders in the Diaspora (Hypothetica 7.12f. ), and archeology confirms that in at least some places outside of Palestine priests were specifically designated as such" (pp. 52-53). Elsewhere he writes: "What is clear is that the rulers of the synagogue were priests, three generations of them, and very prosperous at that. If we must assign them to a party, the Sadducean would be the most likely guess, but there is no reason to think that they represent the party. What we learn from the [Theodotus] inscription is that a family of wealthy priests who could speak Greek built and maintained a synagogue for Greek-speaking pilgrims, and that the synagogue had a dual purpose of serving as a guest house and a place of instruction. The inscription supports the evidence of the literature: it was the priests who taught the law" (pp. 176-177). And finally, Sanders writes: "The Theodotus inscription is graphic evidence of the role of priests in synagogues, a role that some retained in the Diaspora. We recall that according to Philo a priest or elder was responsible for sabbath instruction (Hypothetica 7.13). At the synagogue in Sardis an inscription was found that refers to a man who was a 'priest and teacher of wisdom'. This is from the fourth century. Its relevance is that it shows continuity with the passage of Philo and the Theodotus inscription. In neither Palestine nor the Diaspora did priests withdraw from public life and community study and worship. ...The priest or elder read and interpreted the Bible, and others for the most part remained silent (Philo, Hypothetica, 7.13)" (pp. 201-202). 6. For Talmudic sources, see Sifra, Emor, i. 1, ii. 1; Naz. vii. 2, 4; 42b, 43a, 47b, 48b, 56a, b; Yer. Naz. 56c, d; For Mishnaic sources, see "Yad," Bi'at ha-Mikdash, iii. 13-15; ib. Ebel, iii. ; Shulhan 'Aruk, Yoreh De'ah, 369, 371.